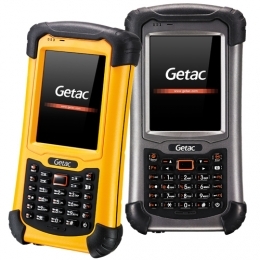 Hard cover - fast core with its 1 GHz processor and 512 MB RAM, the handheld PS336 from Getac is always modern. Its housing repels even extremely rough conditions. It is both MIL-STD-810G and IP68 certified against penetration of dust and water up to 1 m, vibration and impacts. It even withstands repeated drops from heights over 1.8 m. Thanks to its integrated temperature module implement it also in extreme temperatures of -30 C to 60 C.
With an impressive battery life up to 12 hours, the PS336 is a reliable partner on the street, at construction sites, on the premises or in production. If things take longer - no problem simply exchange the battery, thanks to its integrated Lifesupport technology, which keeps it operational without data loss. Due to its particularly bright touch display 600 Nits you are ensured excellent reading conditions in bright sunshine as well as underground. With a screen size of 3.5 8.9 cm it offers plenty of space for straightforward operation with a touch pen or finger, as well as with gloves, of course. The handheld contains all the tools and communication channels that you need 802.11 b/g/n, Wi-Fi, E-compass, altimeter, G-sensor and GPS with SiRFstar IV module for extremely precise positioning. The specially developed FlexiConn technology allows you to use various hardware modules a 1D barcode reader, a Smartcard reader, as well as a Bluetooth module. The optional Bluetooth 2.0 Class 2 module has a radius of up to 600 m, for management via stations and facilities without any additional equipment. Add to it an auto focus camera with 5 megapixels and flash, as well as seven programmable function keys, to speed up and simplify your work. With a standard 3-year manufacturer warranty, you are on the safe side with this investment.